As the fastest, cheapest way to redecorate a room, it’s no surprise that paint is the most popular decorating choice for walls. But don’t stop there: the right type of paint can cover wood, metal, and tiles. Good preparation affects the finished result, so if you want what you paint to look good and last, it is essential to prepare surfaces thoroughly. Covering existing paint with fresh paint is the simplest method of re-decoration. If there is wallpaper, you should strip it off first; however, many people do take the shortcut of painting directly onto paper. The effect is less uniform, but it may be adequate in less important rooms that you want to decorate quickly. Remove nails and picture hooks. Wash ceilings, walls, and woodwork with a solution of water and sugar soap (or very mild detergent). Rinse, and allow to dry. Treat any mould that may have formed as a result of condensation. Scrape it off, then wash the wall with very diluted bleach, air-dry, and apply fungicide following product instructions. Apply wood primer to bare wood on doors, windows, frames, and skirting. Rub down metalwork with steel wool to clean off rust and flaking paint. Apply metal primer. Fill small wall and ceiling cracks with filler. This comes pre-mixed; simply apply it with a flat metal filling or putty knife, so that it stands slightly proud of the wall. When it’s dry, smooth and level it with sandpaper. On the ceiling, long straight cracks will be very difficult to disguise, but it can be more effective to paper the ceiling, and then paint over it, you may need a decorating contractor to do this. Go over old gloss paint on wood with a sheet of rough sandpaper, to provide a surface the new paint can grip. Finally, check again for dirt and dust, wipe all surfaces to be painted with a damp cloth and remove fingerprints on wood with a cloth dipped in white spirit. You are inexperienced in painting and may overload your brush. You are covering a deep or contrasting colour. Many different paint finishes are now available as water-based paint. They dry quickly, need no primer or undercoat, don’t smell unpleasant, and splashes can be removed it they are cleaned oft quickly enough. This water-based paint is used tor walls and ceilings. It dries quickly, needs no primer or undercoat (in normal conditions), and has an acceptable smell. A paint that gives a flat no-sheen look. It will hide uneven surfaces and small flaws, but marks easily. Mid-ground paint that is suitable for all around the home, it creates a tough, washable surface. Gives a high-sheen look and stain resistance that is great for hallways and playrooms. A thicker paint that gives excellent coverage without a second coat. However, each tin of paint covers up to one third less wall than standard emulsion. Check the label for how much you’ll need before you buy. 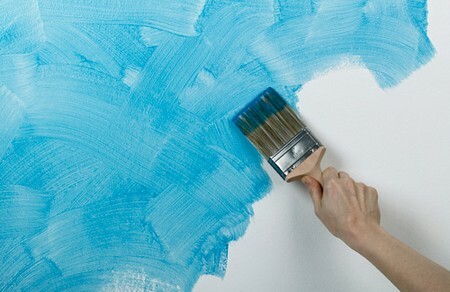 Flecks in this paint give a random ripple effect that can look good on ceilings and uneven walls.